The EBT app combines all apps for the E Bike tuning modules BlackPed, BlackPed+, PumaPed, BluePed, GreenPed and the new RedPed (Bosch, Yamaha Powerdrive & Yamaha Syncdrive) in one application. 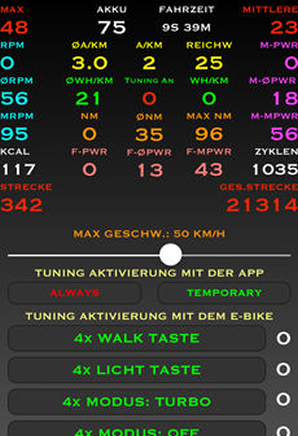 The app enables you to control the E Bike tuning modules. Basic functions, such as reducing the speed to 15 km/h or increasing it up to 75 km/h, are elementary components. Different speedometer views on the smartphone and a virtual logbook are further outstanding features of the EBT app. Demos and instructions can be found within the app. Please note: With the Android app, the location sharing function must always be activated. Start: After starting, the app scans for available modules in the close surroundings. If a module is found, the name, UUID, module and firmware version are displayed. If the signal of a module is no longer received, it is removed from the list. The dBm value indicates the signal strength. Each module has a unique UUID. You can now select the module to be controlled from the list of available modules. Demos and instructions can be found in the app, too. Many E Bike tuning settings possible! The basic settings include setting the maximum speed from 15 to 75 km/h, setting the wheel circumference and the Bluetooth visibility, defining the activation code, naming the app, either sharing or freezing the speed, activating GPS, recording trips as well as exporting or deleting trips. The BlackPed, BlackPed+ and PumaPed show halved values on the E Bike display and correct values on the smartphone. 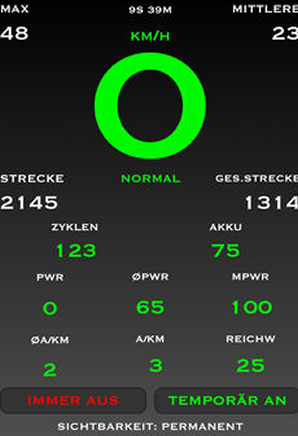 With RedPed, BluePed and GreenPed, however, correct values are shown in the E Bike display and in the smartphone. Important: Each module may display different parameters and may have different setting options depending on the type of construction, the E Bike motor and the respective operating system of the app. View: Basically you can use the smartphone very well while riding if you have attached it to the handlebars. The EBT app has two speedometer screens: Either "easy" or "pro". The "easy" view is reduced to the most important settings, while the "pro" view offers additional settings and many other values. Tip: You can also leave the smartphone at home and control the module with a predefined activation and deactivation code ! Logbook included in every EBT App ! Logbook: The GPS recording has to be activated. This allows GPS data to be recorded at 5-second intervals, plus all data displayed in the "pro" view. And these are many values. This function is active for all EBT app users with built-in modules (the connection between smartphone and module must be established). Start Display "easy" Display "pro"